Using the data gallery widget will allow you to present the images you have stored in your database in a form of a gallery. Click here to view a live example of the data gallery tool. After dropping your gallery widget into place, a new window will open allowing you to set the design of your gallery. As you can see below, you will be able to choose the layout, colors, spacing and more. After designing your table it&apos;s time to connect the data. Click on your new object and go to "Gallery settings". 1. Edit- Choose the table you would like to present and the image column you would like to use for your gallery. You can also connect a URL field and choose if and from where to take the image title. 2. 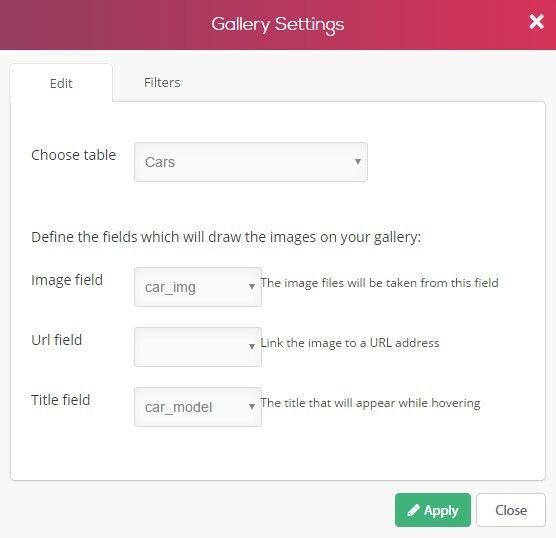 Filters - Set a criteria to your gallery or connect it to a search form. Don&apos;t forget to publish your site and click view live to see your result.